Numerous laundries, shops, eateries closed. No one to wash dead bodies. Jeddah/riyadh – Residents and residents woke up on Tuesday to a day injured by an absence of fundamental administrations as unlawful expat specialists, who neglected to correct their status, stayed inside for dread of being captured. Roads were less gathered where cab drivers charged extreme admissions, showcases wore a forsook look, numerous business stations and healing facilities reported no-shows, shades were down on numerous supermarkets and eateries, road sellers were no where to be seen. Clients were constrained to fill foodstuff packs themselves at grocery store counters without expat specialists who did this employment. A Saudi national in Jeddah summed up the situation: "It appears that the nation was full of violators. Shops are shut, roads are void, restaurants are vacant. I tallied 30 phone shops on one road shut. God help us! Where are the subjects?" In Jazan, various Saudis said that they needed to head off to their working environments, wearing un-pressed thobe and headgear (shemagh) as a large portion of the laundries remained shut. "There was no path for me to wear a washed and pressed thobe and shemagh as I saw entryways of the laundry where I stored my garments shut without any notice," said Muhammad Qassem. Even the dead needed to endure. In the vicinity of 13 offices for washing dead figures were closed down in Jeddah because of the nonattendance of laborers. The individuals who wash dead figures at these offices are low maintenance specialists who are frightened of investigation attacks. Muhammad Fauzy Maulavi, chief of the philanthropy extend for washing dead figures, said that the individuals who wash dead forms are either drivers or have some managerial occupations recorded as their calling. As a consequence of the conclusion of the offices, numerous individuals began taking dead forms to Makkah for washing. In the vicinity of 60 percent of business shops, workshops, products of the soil stalls in Jazan and different urban communities and towns in the area were shut. There have been expanded business exercises at the eateries in the district because of the conclusion of more than 40 percent of restaurants and boofias. "I needed to hold up more than four hours before a restaurant to eat from a restaurant where I saw phenomenal hurry of clients," said Abdurahman Nasheeli. Jabir Kharmi, an alternate native, said that he was compelled to consume lunch from a quick sustenance outlet because of the conclusion of a conventional restaurant where he frequented to have his dish. In the interim, crackdown on illicit ostracizes proceeded all around the Kingdom on the second day on Tuesday taking after the finish of the acquittal period. More than 5,000 illegals were captured on the first day. They incorporated 3,607 in Jazan, in the ballpark of 2,000 in Jeddah and 1,159 in Asir area. Lt. Col. Abdullah Al-Shaathan, agent of Asir police, said that the captured ostracizes incorporated 461 individuals without a legitimate residency allow (iqama), and an alternate 119 who were considered working in violation of the work law. Three Saudis were likewise captured for furnishing transportation to illegals. What added up to 201 illegals were captured in Hail. 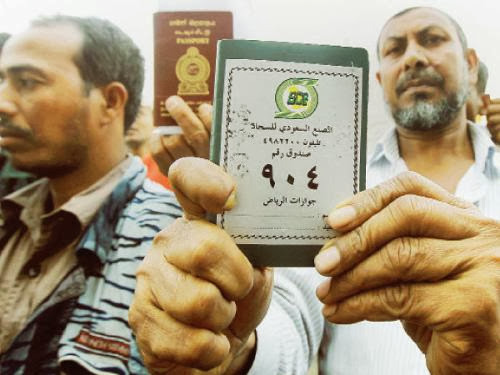 A few illegals from the Asian and Arab nations assembled at their departments in Jeddah on the first two days of the post-reprieve period, looking for fulfillment of the methods to redress their work and residency status. They griped that in spite of the fact that they had enlisted their names at their missions, the techniques for rectification or securing a last retreat stamp have not been finished at the Passports Department. A few departments urged the branch to speed up the paperwork. Ali Al-Ayashi, Consul General of Yemen, requested the branch to finish the revision methods of many Yemenis whose names were enrolled at the office well soon after the closure of the absolution period. The Border Guards in Jazan captured more than 8,000 outsiders having a place with different nationalities who tried to leave the Kingdom illicitly inside the first 24 hours of the post reprieve period.